The Women-Drivers.com team has the pleasure of meeting various leaders within the ever-expanding and exciting automobile industry. We discovered three companies, AutoRef.com, BankHunter.com and ClearMechanic.com, which offer unique and innovative technological contributions in sales, finance and the service phase of a dealership’s business. I recently had the pleasure of spending time with Michael Bailey, director of marketing at AutoRef.com; Gina Parr, founder and chief executive officer of BankHunter.com; and Brad Simmons, CEO of ClearMechanic.com. Let’s take a closer look at what each platform offers and how dealers can immediately increase sales while positively impacting their bottom line. There are so many competitors in this sphere; what makes your business platform unique and a value-add to CPO dealers? "What makes AutoRef.com different is that we're focused on used-car negotiation happening online, and our service covers everything from price to financing to warranties and other dealer perks. We are the complete solution for connecting used-car and new-car shoppers with thousands of dealerships online to save time and money for both parties." "There are many platforms in auto finance allowing dealers to submit applications to banks and credit unions. But in this age of technological automation, matching a buyer to the best bank for the deal is still done manually. BankHunter.com is a patented program that chooses the best bank so the dealer doesn't have to, cutting the sales time in half and raising revenue by as much as 50 percent for dealers. Simply fill out the credit app and click the mouse. Your top three lenders appear immediately." "ClearMechanic.com is a complete selling solution for automotive repairs. We enable service centers to 'visually sell' repairs with real-time photos, videos and diagrams. We also automate personalized, visual follow-up letters to consumers who decline service recommendations, giving the service center another chance to win back lost business." How do you save the dealership time and money? How do you help them sell more cars and bring in customers? "Dealers that respond to our leads will close at a minimum of a 37-percent rate. Our traffic has been dramatically increasing at a rate of 5x month-to-month. AutoRef is great for dealers because salespeople are able to save significant time and money in the sales process. Imagine if every single customer that came to the lot closed, and that's what you're getting with our leads and customers. They've negotiated, compared offers, and now they're ready to buy." "Dealers are always talking about improving the buying experience with the highest rate of efficiency. BankHunter accomplishes both like no other dealer tool I've ever seen. BankHunter nearly doubles the number of credit approvals. We reduce the lender decision time by an average of 90 minutes. Using our distinctive services increases dealership sales nearly 20 percent. "ClearMechanic helps service centers sell substantially more repairs. Nationally, consumers only say 'yes' to 30 percent of repair recommendations. Visual selling moves this approval rate up to 50 to 70 percent, a dramatic increase. "Beyond selling more, ClearMechanic also helps service departments in two ways: 1) win back lost customers through 'visual decline service letters' and 2) higher retention of service customers when vehicles go off-warranty. A core problem for dealership service departments is the defection of car owners to independents and chain shops when vehicles are off-warranty. "Dealers must retain these customers and will never be able to compete purely on price. Instead, they must offer convenient, trustworthy service to differentiate themselves." Why is your platform "women+family friendly?" "AutoRef’s platform is friendly to everyone, because it allows the negotiation to happen in an open forum. Haggling can be frustrating and difficult in person for women buyers because the automotive industry has an overwhelming male presence, and our platform allows women to get a great deal easily online. On average women pay about a $1,000 more than men for cars; through our platform, that gap doesn't exist." "BankHunter benefits women and families by reducing the potential of discriminatory lending practices and time spent in a dealership. Imagine driving off in your new car in a couple of hours instead of the average 4.5 hours. BankHunter literally transforms the car-buying experience; we save your customers and your staff real time." 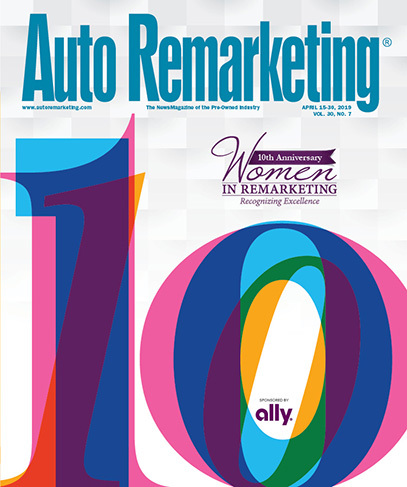 "Studies indicate that women are particularly skeptical of auto repair providers, fearing price gouging and unnecessary repairs. ClearMechanic enables service centers to offer hard visual evidence of a repair need, which all customers appreciate, women included. Showing leaks, cracks and wear is common, as are videos of tests and diagnostics. Our clients quickly realize that every repair recommendation can be validated with a real-time video." Do you work with CPO and new-car dealers? "Absolutely! The technology benefits all auto dealers." "Our solution is relevant to any automotive service or repair center."